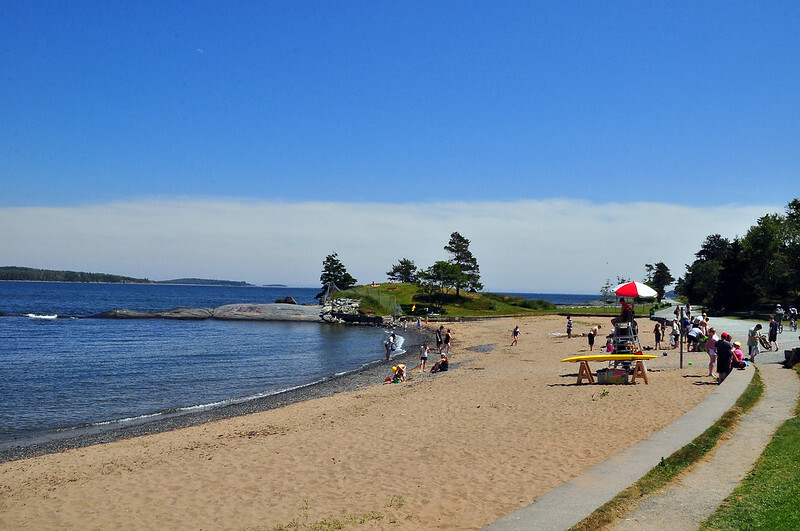 Staying with beaches, this week we’re visiting Black Rock Beach in my hometown Halifax. 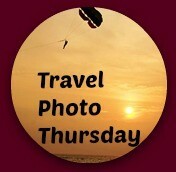 Welcome to week 287 of Travel Photo Thursday (7/21/2016). Apologies if this post seems a little rushed, but I’m off to Canada in the morning. I took these shots when I was home in 2013. Enjoy the beach! 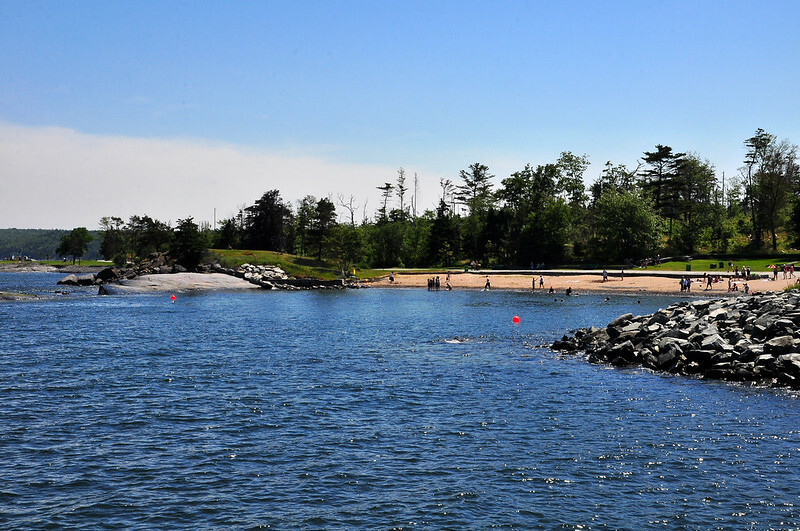 The beach is located in the city’s largest park, Point Pleasant Park, deep in Halifax’s south end. Just follow the park road to the bottom entrance (closest to the North Atlantic), park your car or bicycle in the parking lot. 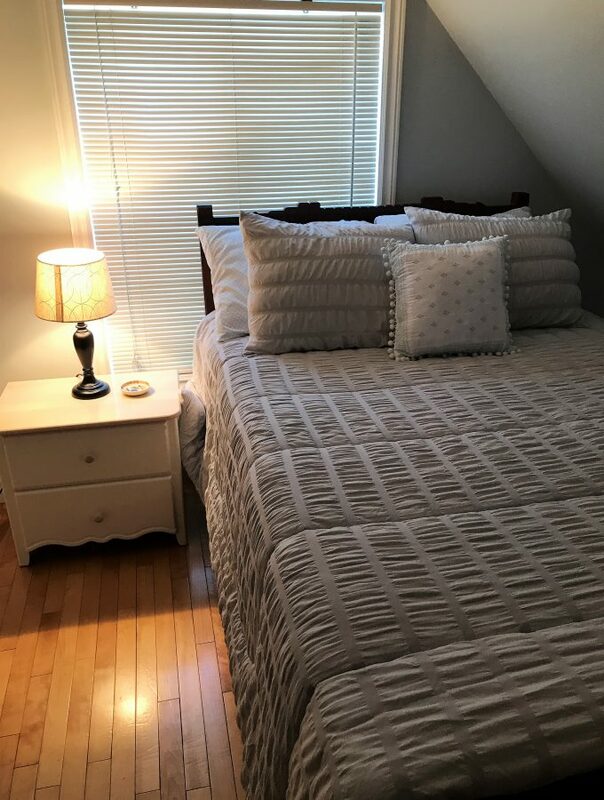 The beach is also within walking distance of downtown. You can see the beach from the parking lot. Believe it of not the park is not owned by the city, the province, or the country. It’s owned by the British Government and leased to the Halifax for 1 shilling a year. The original contract dates back to 1866. 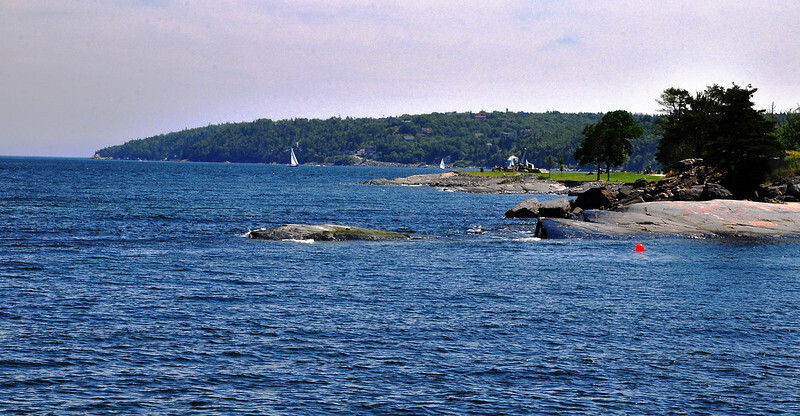 With its black rock outcropping, the beach is easy to see from the land or the ocean, and it’s always been popular with Haligonians. When I was growing up, it was often closed to swimming due to sewage run-off. That’s all changed now, and during the summer months, the beach boasts a lifeguard seven days a week. You can see the lifeguard stand in the photo below. Back in the 70’s/80’s the city would host free Natal Day concerts. One year they even headlined The Beach Boys! Going back a bit further into the history books, in the 18th century, the black rock outcropping had the dubious distinction of being used to display executed criminals publicly! Personally, I prefer the concerts to the executions! From the shore of Black Rock Beach, you can gaze out onto the North Atlantic. The graffiti on the rocks is a new (and I don’t think a welcome) addition. There’s always sailboats going by. Who can resist ice cream on a hot summer day? 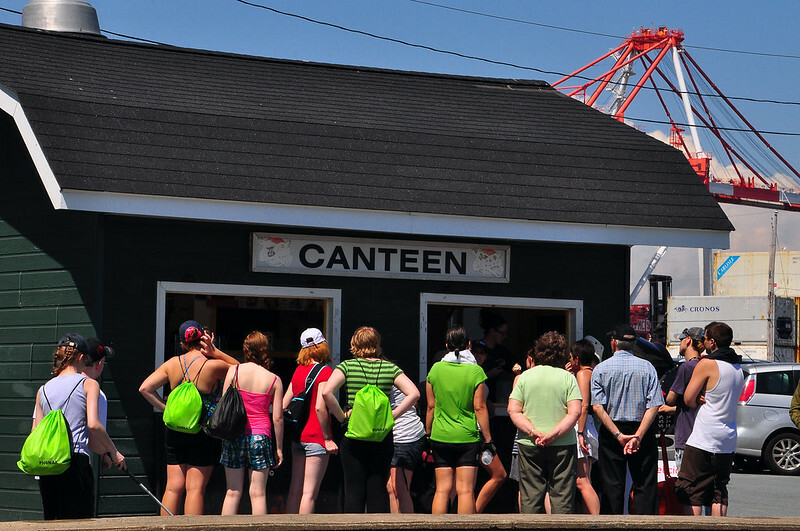 The Black Rock Beach/Point Pleasant Park Canteen has some of the best in the city. If you’re at the beach or in the park, don’t walk by without grabbing a cone. One last thing, and I don’t have a photo. There is an enormous polar bear swim off the beach every New Years Day. I have to say I am a wimp, but when I lived in Halifax, I would always go and watch the shock and awe of the swimmers hitting the freezing water. Great fun! While not nearly as long as last weeks Barceloneta Beach, Black Rock Beach has a charm all of its own. The beach and the park are open daily from sunrise to sunset. 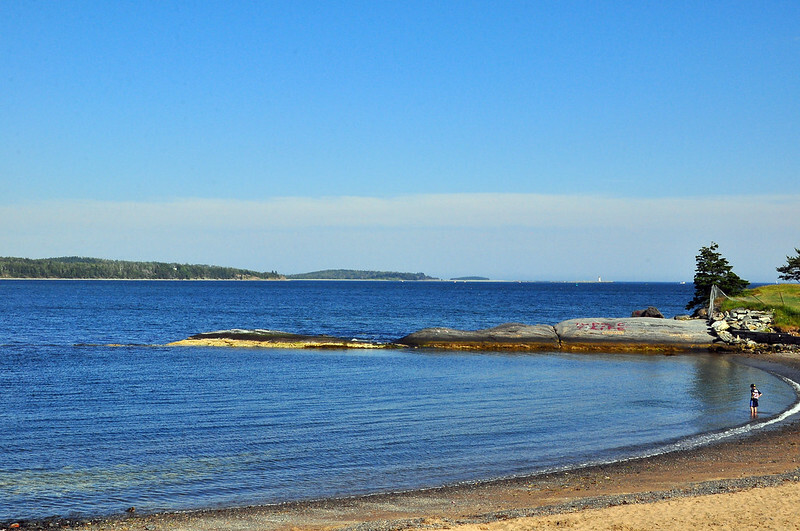 Did you know that Halifax had a beach close to downtown? Have you been? Nancie, I love traveling around Halifax. It’s such a gorgeous little city. And I have to admit I know so little about Halifax that I love these posts – I am learning so much! Are you back in Canada now? West coast or east coast? What a pretty spot but I would imagine the water to be a little chilly! The British really got themselves a bargain! Seeing how there are life savers I guess it does get warm enough to actually swim? The beach is very cute. I love it. Maybe you will be swimming there soon? With such beautiful, blue crystal water, I see why it’s so hard to avoid this Halifax beach. Fun to learn about this beach and ready to head here for a summer get-away. This is a nice beach! It is kind of strange that it is owned by the British Government. I wonder what else is owned by them. I do not enjoy when graffiti is added in natural areas. you’re in the north Atlantic and I am in the Indian Ocean off north west Western Australia. You can keep your polar bear swim. Way too cold for me! Happy travels. Such a beautiful place. I didn’t know the park was owned by the British Government, thanks for the info. I applaud you for posting something even when life gets crazy. I basically took a break for almost the entire summer. Anyways, I would not have guessed that people from Halifax are Haligonians. It looks like a great beach (minus the grafitti), and what a fascinating bit of trivia that they leas it from the Brits.